The bad news is that we, the individual investors, collectively don’t do so well when investing in stocks. 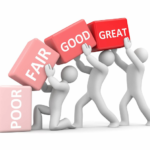 The good news is that most of this underperformance is due to our own behavior and therefore can be fixed. When the stock market falls (as it is known to do from time to time), most investors panic and sell out of stock mutual funds. As the market recovers, they gradually transfer assets back to mutual funds. In other words, they cash out of stocks when stocks are cheap and chase performance when they become expensive. Take a look at this chart from the Dalbar report. In last 20 years, the US stock market has two major declines – 2001-2002 and 2008-2009. In both periods, investors poured money into money market funds just when stocks were tanking – locking in their losses. 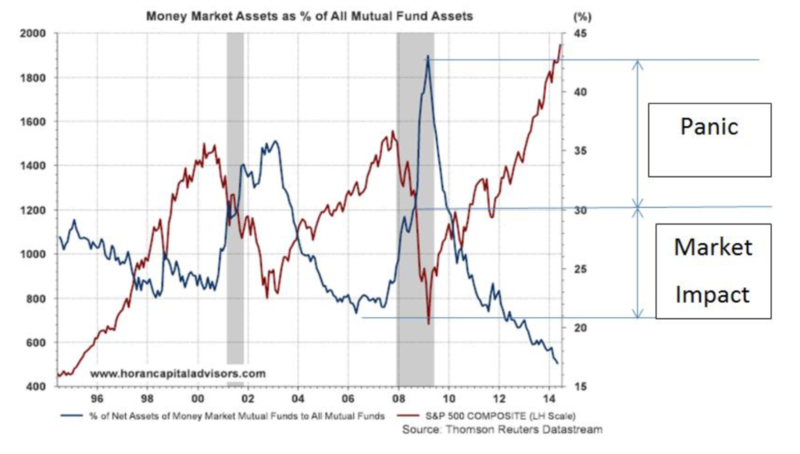 At the bottom of the bear market in 2009, more than 40% of all mutual fund assets were in money market funds. From the start of the bear market to its peak, the money market assets went from about 20% to 40%. A portion of this big jump is attributed to the stock market decline itself. But according to Dalbar more than half of this increase came from investors selling stocks in panic. 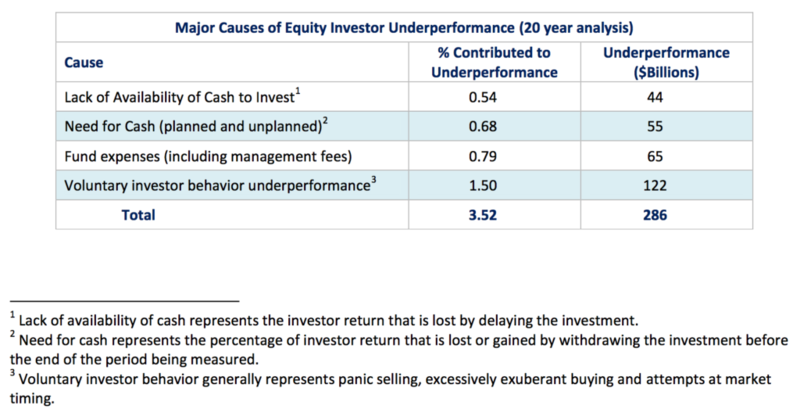 How does this investor behavior translate into actual numbers? The table below from the same Dalbar study measures individual investor’s performance versus the US stock market as a whole (the S&P 500). If you were an ideal investor, you would have bought the S&P 500 at the beginning of a period and just stayed with it for the whole time. 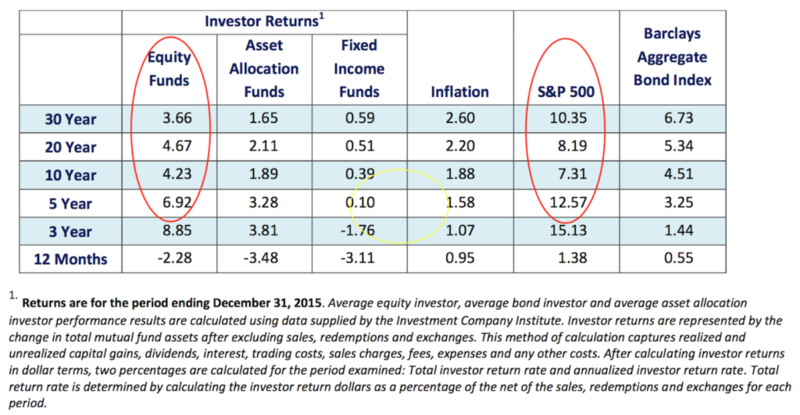 Your results would then have matched the returns shown in the S&P 500 column. However, in the real world the numbers look very different. When Dalbar studied actual investors during the same time period, their performances were far worse. On average, an equity fund investor only got 3.66% annual return versus 10.35% for the S&P 500 over last 30 years. See the Equity Funds column. In the previous 10- and 20-year periods, an average investor has trailed the S&P 500 by more than 3 percentage points. Over 30 years, he trails by a mind-blowing 6% difference. And make no mistake – even a paltry 3-point deficit makes a huge difference when it is compounded over a decade or two. Roughly half of the difference can be attributed to investors’ own behavior – specifically panic selling, exuberant buying, and attempts at market timing. Other factors were also mostly under investors’ control: (a) paying high fund expenses and fees, (b) pulling cash out too soon, and (c) failing to contribute new cash consistently. Don’t try to time the market. Keep a steady hand at the helm even when the market’s mood is fearful (or exuberant). In other words, stay even keel. One handy tool I have adopted to keep myself grounded is to read about the market history. These days, the market is doing very well. So … I take time to read history of the past bear markets. I remind myself that the market (and the economy) is cyclical. Good times will eventually give way to a downturn. I try to keep my portfolio ready to take advantage of lower stock prices. Let your money compound over time. Don’t pull your savings out prematurely. Invest for the long term and reinvest your earnings. Keep investing the money you save – over time and in any market condition. See this post: Investing in Installments. When I was younger and had a busier life, I just had my 401K account on auto-pilot. Dollar-cost averaging into it through market ups and downs. Benign neglect worked out well for me during those 20 years. Keep your investing expenses low. If you are investing in stock funds, go with low-cost index funds. I own Vanguard and Fidelity funds in my own portfolio. If you are investing in individual securities, use a discount brokerage. 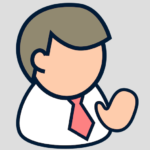 I use Interactive Brokers and Charles Schwab. You can see from my portfolio that all my mutual fund investments are concentrated in low-cost index funds.